When it comes to cool travel gadgets, the SteriPen is without doubt as seeringly cool as it's possible to get. Not just because of the remarkable thing that it does, but also because it looks just so darn hot! Before we get into tech details, suffice to say that within a matter of seconds, this SteriPen will mean you never again have to worry about 'Don't drink the water' signs ever again. 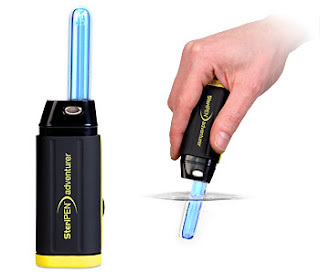 Flip off the lid and dip the end of the pen into your glass of water, turn it on, and the cool UV light will glow bright blue, and in no time it will kill off a whole heap of potential nasties. It's the only patented, handheld water purifier that uses ultraviolet (UV) light to destroy waterborne microbes. Ultra-violet light has been used for 90 years in large-scale systems including hospitals, city water systems and bottling plants to purify water. Independently tested by four universities, the SteriPen has been shown to destroy in excess of 99.9999% of bacteria, 99.99% of viruses and 99.9% of protozoa. To date SteriPEN has been tested against: E. coli, Salmonella Typhimurium, Poliovirus, Rotavirus, Klebsiella terrigena, Streptococcus faecalis, Bacillus subtilis (vegitative and spore), common yeast, Coliphage MS2, Giardia and Cryptosporidum. We don't know what most of those are, but we're pretty sure we don't want to inadvertently drink any of them, that's for sure. Effective against the waterborne microbes that cause giardia, polio, diarrhea, hepatitis, typhoid fever, botulism, dysentery and cholera (just to name a few), we can't imagine travelling anywhere without this compact and invaluable little gadget. Complete peace of mind in a pen, don't you just love the 21st Century! Testing shows that SteriPEN meets the standard as set forth in the U.S. EPA Guide Standard and Protocol for Testing Microbiological Water Purifiers.